The year 2019 marks not only the thirtieth anniversary of the fall of the Iron Curtain, which brought about profound political and economic change for Slovakia and other Central and Eastern European countries. In 2019, Slovakia will also look back on ten years of euro membership. Slovakia entered the euro area on 1 January 2009, which back then seemed to mark the final stage of the (economic) political integration process for Slovakia. The introduction of the single currency thus took place only a few years after Slovakia joined the EU in 2004, together with seven other Central European and Baltic states. Slovakia is therefore one of the countries, along with Slovenia, that was able to quickly introduce the euro after its EU membership. The Baltic countries took much longer (also because they were hit hard by the global financial crisis) and Bulgaria has been waiting for euro membership since 2007. As mentioned, Slovakia’s entry into the euro area at the start of 2009 took place at a time when the global financial crisis was fully affecting Europe and the euro debt crisis including euro breakup fears was already beginning to emerge on the horizon. The radiant power of euro membership, which is also rooted in the implicit promise of prosperity, suffered in the years following the outbreak of the crisis and caused the previous euphoria about joining the euro in the other CE countries to cool considerably. Between 2004 and 2009, about 50-60 percent of respondents in the Czech Republic had a positive perception of the common currency. With the outbreak of the euro debt crisis in 2010 (Greece applied for the first bailout package in spring of 2010), however, the euro’s approval ratings collapsed drastically and have remained fairly constant between 20 and 25 percent since 2012. Similarly, although not quite as drastically, the common currency lost support also in the other CE countries that have not yet joined the euro area. Developments in Slovakia are different though. 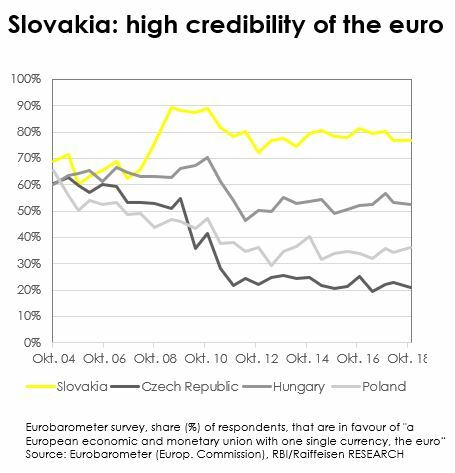 While the euro has gained considerably in popularity between Kosice and Bratislava in the run-up to the introduction of the euro (approval rose from just under 70 to almost 90 percent), the Slovaks’ “€uphoria” in the euro crisis has suffered comparatively little. The all in all positive attitude towards the euro can be explained by the fact that the country was not severely affected by the global financial crisis, i.e. beyond the cyclical slowdown seen in 2009. The solid performance even in challenging times on global financial markets can be explained by a by and large solid public-sector balance sheet as well as a rock-solid banking sector. Compared to Slovenia the euro area membership did not result in a massive increase in the leverage in the private sector, that then affected also the public-sector balance sheet. All in all, one must conclude that in the economic sphere Slovakia can be seen an “inconspicuous” euro area country where membership is based on solid foundations. Given the solid position of the Slovak banking sector the country did not produce any negative news in the context of the sharpened banking sector supervision (SSM, SRM) inside the euro area (that was established after the Slovak entry into the euro area) as well. 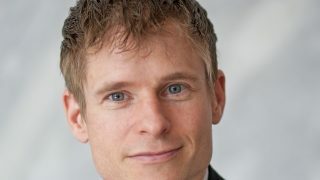 This is also due to the solid business model of the country’s banks, which mainly lend to the local private sector based on local refinancing; in other words, a very different setting than in the Baltic States or partly also in Bulgaria (where there have been certain banking instability issues in recent years). It is therefore important not to underestimate the risks of the partly strong growth in real estate loans – partly also a consequence of the ECB’s monetary policy orientation, which is far too expansive for Slovakia. Here, attempts are being made at the national level to decisively counteract this with macro- and micro-prudential regulation. This makes absolute sense, as even earlier “success stories” in the euro area (e.g. Spain or Ireland) were coming under pressure, due to excessive loan growth over a longer period of time (partly based on the national risks arising from a single monetary policy for the euro area that may not fit all members at the same time). Nevertheless, Slovakia’s relationship to euro membership was not tension-free, at least not during the heyday of the Greek debt crisis. It is worth remembering the scenes in October 2011, when European politicians and financial markets looked anxiously at the vote of the parliament in Bratislava on the expansion of the EFSF rescue fund. Back then Slovakia was the last of the participating euro countries to grant parliamentary approval to the necessary expansion, but a first vote to this effect failed. The second vote, held only shortly afterwards, was successful, but at the price of snap elections. Slovakia did not participate in the first Greek aid package (bilateral loans) from the outset. However, the Greek government’s attitude in Athens, which has met with little understanding in Slovakia in particular, should not go unmentioned in this regard. Not only was the solid budgetary policy of Slovakia (and other CE countries), with a public debt ratio of only 30 percent of GDP at the start of the crisis and the willingness to tackle (fiscal/structural) reforms as demonstrated before joining the euro a striking contrast to Greece’s obvious reluctance to conduct necessary reforms. In addition, the wealth level and social benefits of the Slovaks were noticeably lower than in Greece before the start of the crisis (however, all CE countries have a higher GDP per capita adjusted for purchasing power by now). Loans (by the EFSF, guaranteed by member states) to Greece were therefore politically even more difficult to argue than in Austria, Germany or other (euro) countries of the stability-oriented “northern axis”. But the similarities with this group of countries, which often includes the Baltic and Scandinavian states, go beyond the partial unease with the Greek rescue packages. As such, Slovakia is positioning itself in the current euro area reform debate in many cases similarly to the countries of the core euro area, for example concerning the demand of binding rules on sovereign debt restructurings. Concerning banking union, promoting the European Deposit Insurance Scheme (EDIS) was one of the themes of the Slovak EU Presidency in H2 2016. 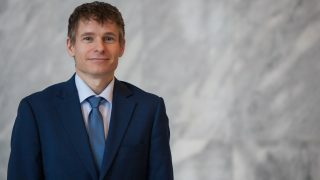 Detached from past episodes of the euro debt crisis and future euro reforms, Slovakia’s economic development in the euro area can be considered as a success. Admittedly, the entry into the euro did most likely not in itself accelerate income convergence with the countries of the core. However, the fact that the economic catch-up process continued at a slightly slower pace in the years following the introduction of the euro than in the years before 2009 can also be regarded as a success. 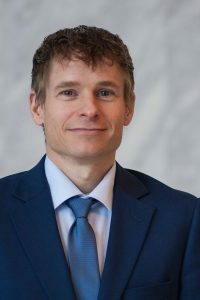 After all, it was possible to raise GDP per capita from 59 percent (2008) of the level of the core euro area to 66 percent (2018) under the conditions of a fixed exchange rate. The key drivers are not so much the euro or EU membership itself, but the preparatory work necessary for the respective integration steps, such as reforms of the institutional framework (even though there is still a considerable need for reform in this area and the institutional quality is somewhat below the CE average) as well as the integration into European and international production chains. 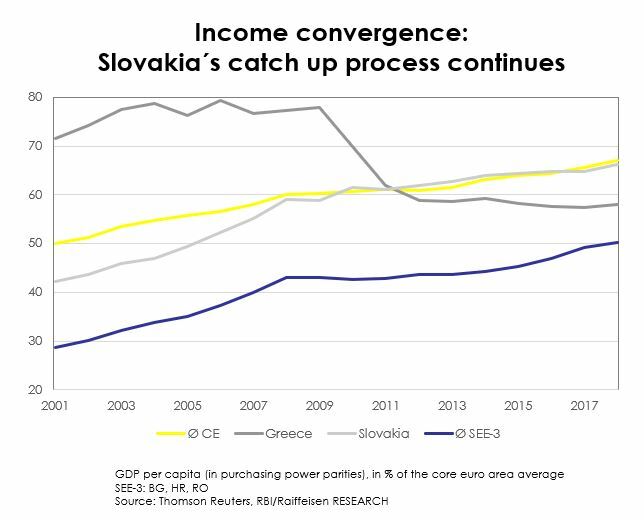 And while reaching Western European income levels continues to be a matter of decades rather than years, the signs are nonetheless good for a continuation of sustainable convergence and for Slovakia’s continued ”quiet” euro membership from both an economic and a fiscal point of view. 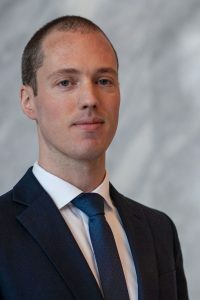 Matthias Reith is an analyst for Austria, the euro area and Central European countries, at Raiffeisen Bank International in Vienna.